Cohousing is a neighbourhood design that combines the autonomy of private dwellings with the advantages of shared resources and community living - it encourages community while maintaining the option for privacy. Not to be confused with co-op’s cohousing uses the strata title ownership structure. To find out more about the difference between cohousing, co-op’s and conventional strata title click here. Cohousing is growing in popularity because it appeals to many different people. Couples with children who want to raise their kids in a communal environment and young adults who want a more sustainable lifestyle, flock to cohousing. Retirees and baby boomers looking to downsize and age in place also are attracted to cohousing. Cohousing meets the needs of all ages as it is a form of shared living in which households have their own private homes and, in addition, share common amenities – a kitchen and eating area, a garden, laundry facilities, kids play area, and a set of principles and practices about living interdependently. It is also an alternative development model where the future residents participate in the planning and development so that it directly responds to their needs. The physical layout is designed to provide personal privacy as well as create opportunities for interaction with neighbours. Cohousing neighbourhoods tend to offer environmentally sensitive design with a pedestrian orientation and have documented lower vehicle use than conventional neighbourhoods. The concept originated in Denmark about 50 years ago and is becoming popular in many countries. It was introduced to North America by two architects in 1988 and since that time approximately 160 cohousing communities have been completed (eleven of which are in BC), with numerous others in various stages of development. The “Senior Cohousing Handbook – Second Edition” by Charles Durrett has inspired projects with a focus on the needs of an aging population. Harbourside Cohousing is an owner-developed strata that combines private dwellings with a community in which neighbours know and support each other, one that will ultimately enable the people who live here to flourish through mutual support as they age in place, and in community. 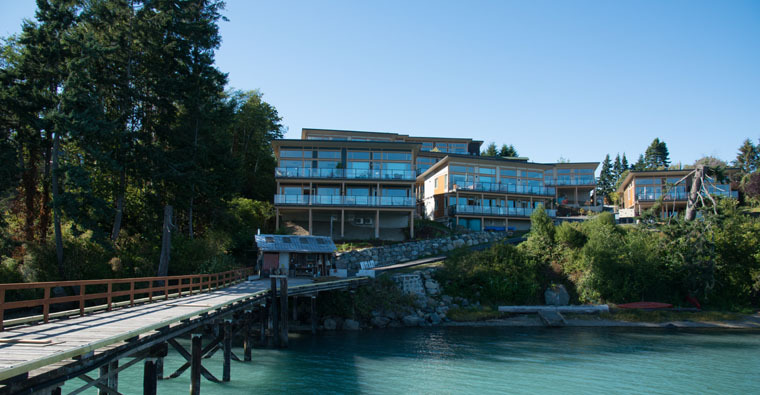 Quayside Village Cohousing, North Vancouver, B.C. 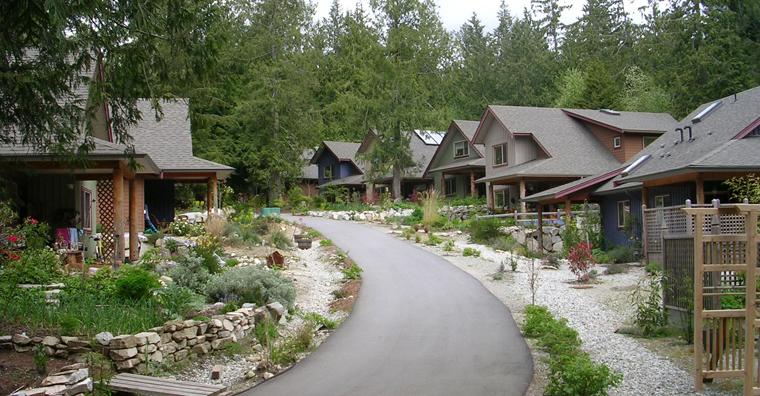 Roberts Creek Cohousing, Sunshine Coast, B.C. Roberts Creek Cohousing a semi-rural community of 31 detached (single family) and attached (duplex) homes on 20 acres of land a short walk to the Pacific Ocean and steps away from the thriving village centre of Roberts Creek. Would you like more information about cohousing? For more information about cohousing in Canada, visit the Canadian Cohousing Network website. Cohousing-L is an email discussion list on all aspects of cohousing -- development, design, move-in, organizing work, community life, governance, finances, legal questions, etc. Many cohousing veterans and professionals participate in the discussion offering information that is almost immediate and unavailable elsewhere. The Cohousing Research Network has an excellent bibliography of peer-reviewed research on cohousing. You can visit their website at this link. A recent (December 2018) newsletter from Cheryl Gladu has links to some of her recent writings.